Had a great opportunity to buy a used Hyde skiff till the owner decided to keep it at the last minute. So I've decided to build one with some friends and I like the style of the new Hyde Montana skiff. Have any members built a skiff that they would like to share a pic or two to give me some ideas and suggestions to use here in our Michigan waters? Very much appreciated. 46" inches is awful narrow. It will be side-to-side tippy. Sorry I missed this post. Not sure how long it's been here. Most Grand Canyon Dories are 48" inches and (in my not so humble opinion) way too narrow at 48" inches. Nearly all of them are derived from the Jerry Briggs design. Martin Litton wanted him to build a Grand Canyon Dory. Jerry Briggs was making standard 15' foot long by 48" inches wide open fishing dories. One or two GC dories was't going to be particularly good business for him so he did it, but did it in the quickest way possible. He added a four foot flat spot in the middle of a much smaller boat. So he stretched his boat out to longer without making it wider. Sort of like chopping his 15' footer apart in the middle and then splicing it back together again the easiest possible way. GC dory design hasn't changed much since then. I'm slowly getting geared up to make a 17' foot decked white water boat myself. I'll be closer to 60" inches wide. Maybe even 64" inches wide. Thanks Sandy. I figured as much, just wishful thinking. I'll be going with my raft and start on the Honky Dory this fall. Thanks a million for this great site. One more thought about wider boats. The original McKenzie River Boat--what ever it is--Woodie Hindman or maybe even earlier--has been described as a perfect example of "Form Follows Funcion." It is that to some degree. But it's also a good example of Form Follows Material Convenience. Plywood is 4x8 in this country. If you splice two sheets together you get a 4x16 panel (minus two inches or so). The original boats were all made from 4x16 side stock. 4' by roughly 12' foot bottom. All because plywood made those numbers the easiest to deal with. So those original boats were all 48" inches wide by roughly 15' feet long. When people started clamoring for a bigger boat Oregon builders scaled those original numbers up proportionately. If you scale 15 up to 17 you need a 1.13 multiplier. 48 times 1.13 is 54. That's why ALL 17 foot boats are 17 feet long and 54 inches wide. It's the same boat as the original, scaled up slightly. The Honky Dory started off as a 15' foot boat with a 56" inch bottom. That is wide. Scale that up to 17' and you get a 63" inch bottom. I tell people that and they recoil in despair. 64"???? That can't possibly work. That's too wide they say. 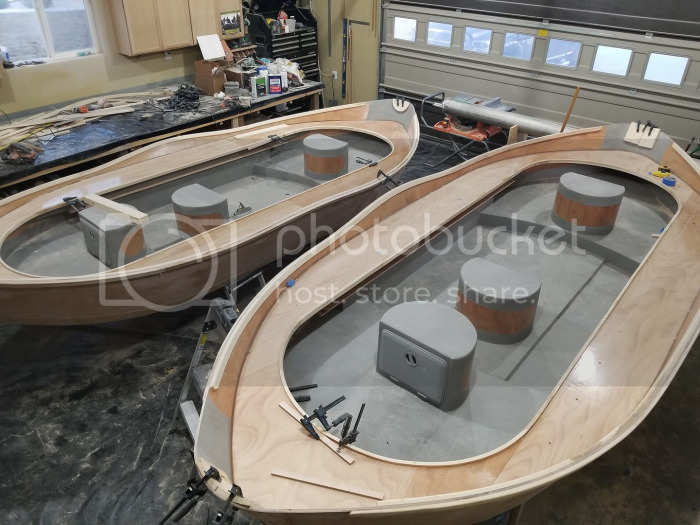 But Cyrus Happy has built some giant boats for the Deschutes, made from 20' foot panels, that are something like 69" inches wide across the bottom. They row like a dream for their size. To find out what really works you have to have guts. You have to take chances and also take your lumps. I've had many experiments that didn't work. Wider drift boats are one experiment that has worked out well. Very well. I'm still one of the few, if not the only one, who makes PROPORTIONATELY very wide boats. My one man boat is 54" inches wide and 9' feet long. It rows circles around any other oar powered river craft ever made. Well OK I don't know that. But it's way better than any I ever rowed. My decked big water boat will be at least 64" inches wide. Maybe even bigger. What is going on with this forum software? Anything is possible. Wood allows a builder freedom to do whatever you can think up. Some ideas are good.... Some ideas you learn. Either is a good thing.